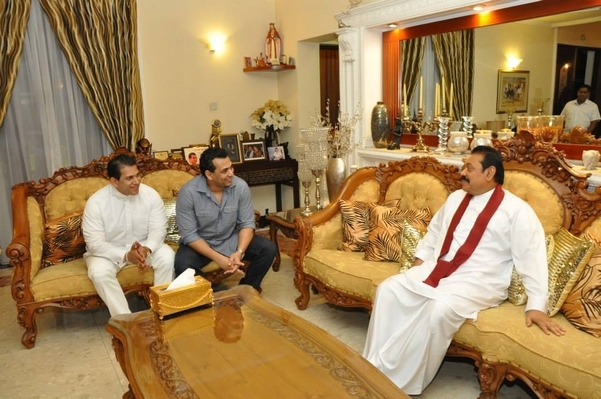 His Excellency President Mahinda Rajapaksa visited MP R. Duminda Silva’s residence at Battaramulla yesterday. Later the President engaged in a pleasant conversation with the parents, sisters and brothers of the MP R. Duminda Silva. The Topic of Television Ratings in Sri Lanka was also discussed by HE Mahinda Rajapaksa in detail with the Chairman of Hiru TV Mr. Rayynor Silva. Click here to view more photos of the occasion. "HE President Mahinda Rajapaksa Visit to MP R Duminda Silva's Residence in Battaramulla" | Login/Create an Account | 40 comments The comments are owned by the poster. We aren't responsible for their content.